Now it’s almost news if Eric Lamaze doesn’t win a WEF Challenge Cup. 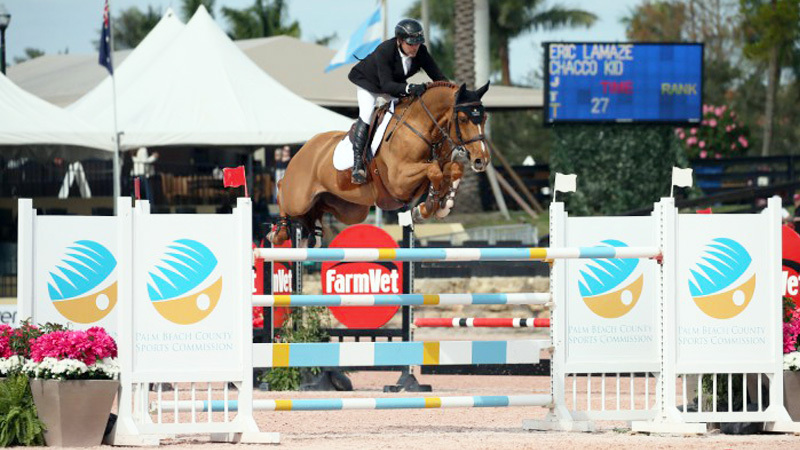 On Week 3 of the Winter Equestrian Festival, Lamaze notched his 25th victory in the Thursday grand prix series of WEF, this time in the $35,000 Equinimity WEF Challenge Cup Round 3 with Chacco Kid. The $35,000 Equinimity WEF Challenge Cup Round 3 had 85 entries, and there were 27 clears over the course designed by Peter Grant of Canada. Seventeen of those returned for the jump-off, and it was once again Lamaze and Chacco Kid who were fastest to lead the victory gallop. They crossed the timers in a speedy 40.02 seconds, the fastest time of the day and also a clear round. Lamaze now ties Olympic gold medalist McLain Ward for 25 WEF Challenge Cup victories, the most in the history of the class. Lamaze and Chacco Kid won this class just last week as well. Second place went to Sunday’s 1.45-meter classic winners, Marilyn Little and Clearwater, owned by Karen O’Connor. They finished clear in 41.37 seconds. Olympic gold medalist Beezie Madden and Abigail Wexner’s HHS Hercules were third in 42.28 seconds. While the class was stacked full of tough competition, Lamaze felt it was a good learning experience to go for speed with Chacco Kid, a 12-year-old Oldenburg gelding by Chacco-Blue owned by the Chacco Kid Group. Lamaze knew going into the class that he would compete in the jump-off, even though Thursday’s class is the qualifier for the Saturday night grand prix. “It’s the beginning of the season,” he explained. “The horses are fresh. He feels really good. He’s jumping well. Nothing is telling me that I should have saved him for Saturday. I have a superstition about that. I feel it’s bad luck. See full results of the $35,000 Equinimity WEF Challenge Cup Round 3.